Do you know how humidity issues affect the performance of your heating systems? Let’s discuss some basic humidity principles, how it affects home heating operations and what you can do about them. Relative humidity (RH) describes the amount of moisture in the air as a percentage. The ideal winter humidity ranges from 40%- 60%. Outside of these levels means your home is at risk of IAQ issues. Low humidity is common in the cold months since the cold air is not able to hold as much moisture as warm air. Problems encountered with low humidity include dry skin and nasal passages, aggravated sinuses, irritated eyes and even damage to flooring. The temperature inside also becomes cooler than the thermostat reading. Your heating units may be working too hard but still can’t provide the comfort you deserve. What Causes Humidity to Drop? The most common causes are leaks and poor insulation since these allow cold air to enter your home. Even with a humidifier, it will be hard to overcome this influence with the continuous cold air movement in your home. Since cold air holds less moisture, it becomes a dehumidifier and causes indoor humidity to drop. Aside from your health, your heating systems are also at risk of overheating due to low indoor humidity. Even at optimum performance, it will be hard for them to keep a comfortable indoor temperature when moisture is too low. This is the reason why you still feel cold even when the thermostat is set too high. Adding an appropriate amount of moisture is the best remedy for low humidity issues. But before this, you need to identify first the pathways where air and moisture are traveling through and seal them. Most of the time, poor insulation and duct leakage are the culprits behind this issue. Use a portable room humidifier. Place water basins near your heating units. Add a whole house humidifier. 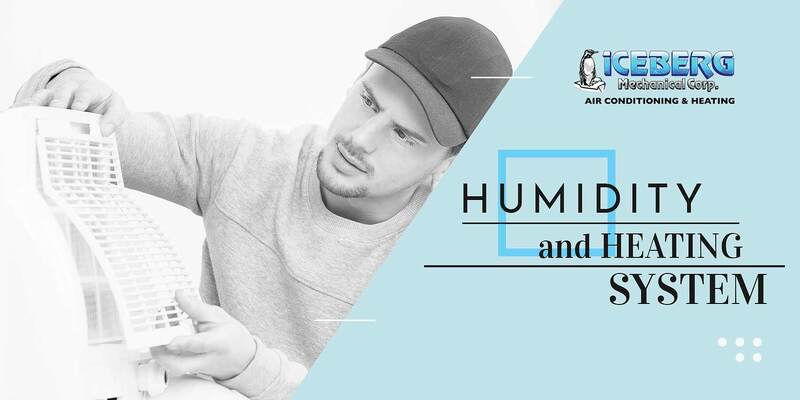 Keeping the right humidity level is important for a comfortable winter season. If you are having issues with your indoor moisture, do not hesitate to give us a call at Iceberg Mechanical. We are always ready to help you with your comfort needs.